4-6 kg. Up to 12 hours of protection. Baby Dry wetness indicator. 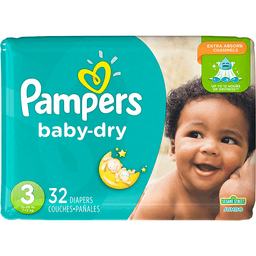 Pampers.com. 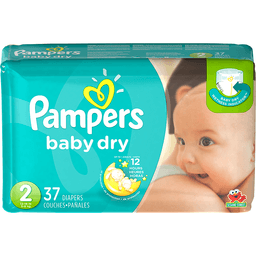 Pampers has 3 layers of absorbency versus 2 in the other leading brand. Flexes for a snug and comfortable fit. Ultra absorb core for outstanding leakage protection. 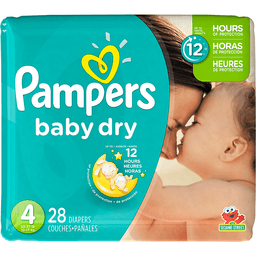 Pampers rewards by gifts to grow. 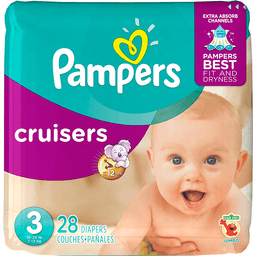 Join (See pampers.com for details and expiration date)! Made in USA from domestic and imported materials. 5-8 kg. 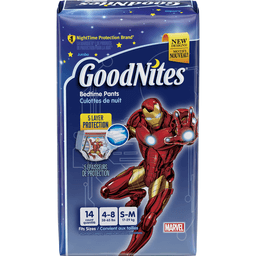 Up to 12 hours of protection. Baby Dry wetness indicator. 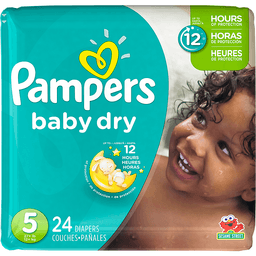 Pampers.com. 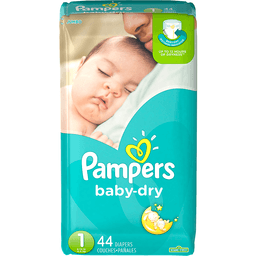 Pampers has 3 layers of absorbency versus 2 in the other leading brand. Flexes for a snug and comfortable fit. Ultra absorb core for outstanding leakage protection. 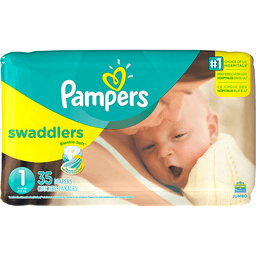 Pampers Rewards by Gifts to Grow. 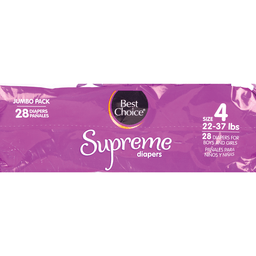 Join (See pampers.com for details and expiration date)! Made in USA from domestic and imported materials. With Night Lock Plus. Locks away wetness even overnight. 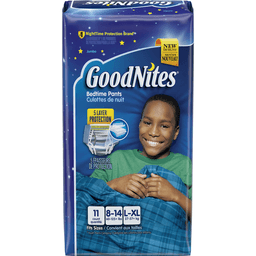 Plus super soft! Money back guarantee (if you're not completely satisfied, please send the original receipt and UPC to us within 45 days of purchase for a full product refund via prepaid card. Limited to one redemption per household or name. 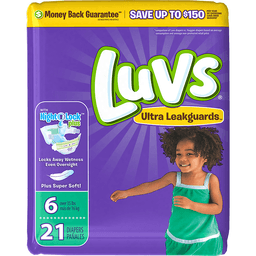 For additional details, please call 1-888-no-leaks (1-888-665-3257)) see back panel for details. 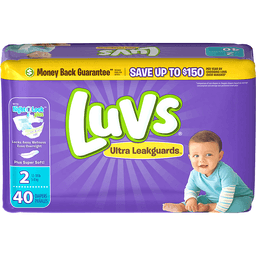 Save up to $150 per year by choosing Luvs over Huggies (comparison of Luvs diapers vs. Huggies diapers based on average consumption and average non-promoted retail price). Locks away wetness - even overnight plus with Night Lock Plus. Super soft on baby's skin. Large refastenable stretch tabs. Wide fastening area. Leak barrier leg gathers. Great fitting contoured shape. Fun design included inside package. Made in USA from domestic and imported materials. Limited edition. 8-15 kg. 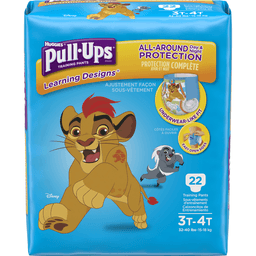 Free Disney activity book! Disney Junior. Mickey and the roadster racers. Protection. Trusted protection. Easy open sides. Dispose of properly. how2recycle.info. 1-800-990-4448. 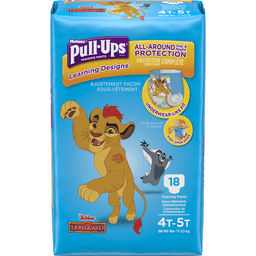 Mo-Fr: 7:30 am 7 pm CT. pull-ups.com. 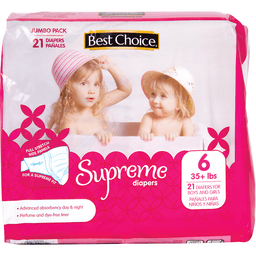 Earth's Best® TenderCare 2 12-18 Lbs Premium Earth Friendly Diapers. 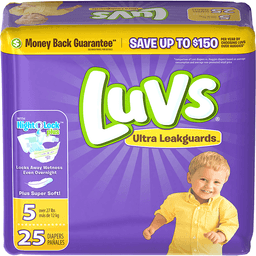 40 diapers. 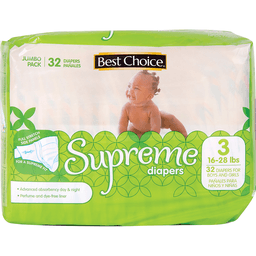 Superior absorbency. Comfortable and secure fit. Hypoallergenic. Chlorine free. Latex free. Dye free. Fragrance free. 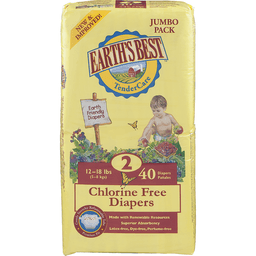 New Earth's Best® environmentally friendly disposable diapers are made from chlorine free materials and provide ultimate comfort for your baby. 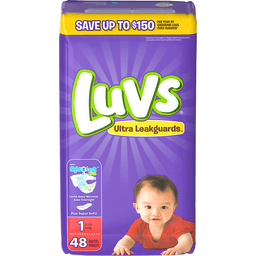 Earth's Best® brand offers products that are better for your baby and the environment. 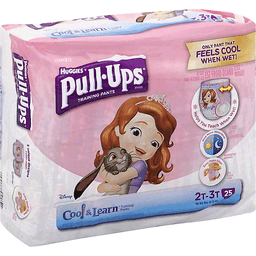 All babies begin life 100% pure... diaper them accordingly. 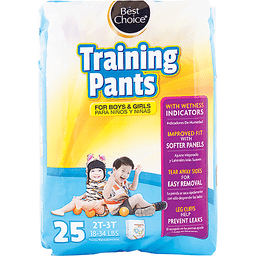 Earth's Best® diapers are made from only chlorine free absorbent materials which means they are never treated with chlorine bleaching agents that can contribute to dioxin pollution. The Earth's Best® difference: No chlorine processing or harsh chemical bleached materials - gentle, safe, & non irritating for most sensitive skins. Hypoallergenic - latex-free, dye-free, perfume free. Comfortable, secure fit - soft & stretchy refastenable panels prevents leakage & blowouts. Earth friendly - made with naturally sustainable materials. 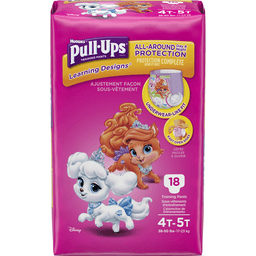 Contains plant based super absorbent materials, gentle on your baby's sensitive skin. Join the Earth's Best® family at www.earthsbest.com and receive valuable coupons and other special offers. 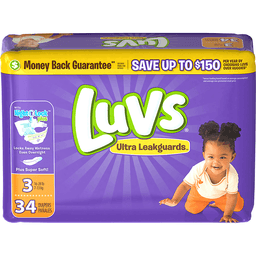 Introduce your baby to the whole line of Earth's Best® products including organic infant formula, organic cereals, organic baby food, organic toddler snacks & meals, and chlorine free baby wipes. 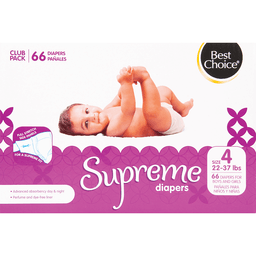 Reduce your environmental footprint with Earth's Best® earth friendly diapers. 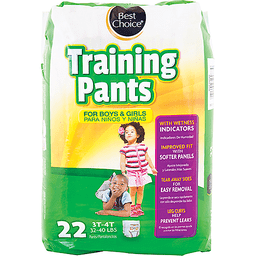 Made with non-chlorine bleached materials that reduce dioxin pollution that is released into the environment. 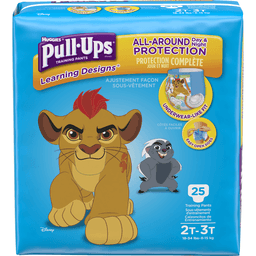 Made with natural absorbent materials such as corn and wheat - annually renewable resources that reduce the use of petro chemicals. Non-woven inner and outer cover, made with plant based renewable resources. Comments Call 800-434-4246. Please visit www.earthsbest.com. ©2014 The Hain Celestial Group, Inc. All rights reserved.